The first SACOSAN was held in Dhaka in 2003, so the return of SACOSAN VI in 2016 was like a homecoming – at least, that was the opinion of Junaid Ahmed, the World Bank representative (and former regional team leader of WSP South Asia) who chaired the initial session. Those stuck in the notorious Dhaka traffic for three hours while returning from the conference venue were perhaps less enamoured with the return, as were the Pakistan delegation (who were allegedly denied entry to Bangladesh to attend the conference); but it was certainly nice to see so many familiar and welcoming faces in the home of CLTS. Following the country presentations, a question from the floor asked whether it was true that a recent survey found that more than 50% of the toilets built in the last year (under the new Swachh Bharat Mission) were no longer functioning. The head of the Indian delegation roundly denied the assertion, despite a December report by the Comptroller and Auditor General of India (reported in the Times of India “Sanitation programmes have failed to achieve targets: CAG” 08 December 2015) confirming that India’s sanitation programmes “have failed to achieve the desired targets [despite nearly Rs 10,000 Crore spent on the rural sanitation programme by the central government in the five years covered by the audit] largely due to planning level weaknesses even as large-scale diversions, wastages and irregularities were detected”. The CAG pointed out that the Swachh Bharat Mission was launched in October 2014 with the aim of a 100% open defecation free India by 2019, but that similar targets for OD eradication had previously been set for 2012, revised to 2017, and again tabled for 2022. The country’s top auditor noted that “the conceptual framework kept changing from supply driven to demand driven and finally to ‘saturation and convergence’ approach, yet the lessons learnt and experimentations through this long journey do not seem to have made much impact on the sanitation status in the country”. The all-too-familiar paradox: the country that has invested more on rural sanitation over the last 20 years – with investments in each five-year plan surpassing a billion dollars - remains the country with the largest population of open defecators. The long shadow of millions of lost toilets – toilets reported as built by the government’s online monitoring system, but found missing by the census and other household surveys – questions whether the Swachh Bharat Mission will be more of the same, and whether it alone can tackle the huge governance issues at the heart of the long-running failure to tackle sanitation. The good news: Nipun Vinayak, the dynamic young director of the Swachh Bharat Mission is a confirmed CLTS champion, with first-hand experience of implementing effective sanitation programmes at the district level. The new SBM program encourages flexible and innovative approaches by the states, in the hope that progressive State Missions can show what is possible when the large SBM budgets are used effectively. I was interested to learn how sanitation marketing was progressing in Bangladesh, as Bangladesh appears to have one of the most supportive environments for sanitation marketing in the world: huge demand generated by the strong ODF progress over the last 15 years; high population density with well developed and easily accessible markets; low material and production costs, with a thriving manufacturing industry; and a strong NGO sector, with high awareness and attention to sanitation and hygiene by government, development partners and civil society. Despite these favourable conditions, the sanitation marketing programmes presented by iDE and WSP, two of the most experienced sanitation marketing actors in the world, remain relatively small scale: the iDE program has reached around 300,000 people (through a number of smaller projects); and the WSP program around 450,000 people. Assuming an average household size in rural areas of around 5 people, this means a total of 150,000 toilets sold (covering less than half the annual population growth, in a country that grows by almost 2 million people per year). WSP also noted that a USD 5 million credit has been provided to about 800 entrepreneurs to improve their working capital, with a total of 1,500 entrepreneurs now reported to be producing and marketing the WSP toilet designs. While an impressive network, the numbers suggest that scale has not yet been achieved: on average, each entrepreneur has sold only 60 toilets; which means that the working credit provided amounts to about USD 100 per toilet – the payback rates on the working credit loans were not discussed, but these figures raise a concern that the heavily supported production network is not yet viable (in the business sense) or sustainable? Another sanitation marketing weakness is the tendency to sell to middle income groups, in effect using the research, development and marketing subsidy provided by the program partners (in establishing the program and training the entrepreneurs) to reduce the cost of toilets bought by households that either already had toilets, or could afford to pay the full cost without assistance. It is undoubtedly a good thing that more people have better and more durable toilets, but remains questionable whether it is the best use of public finance (unless the toilets reach those with the highest disease burden, who are often the poorest, most marginalised, and most difficult to reach through market interventions)? iDE reported that its various projects have reached 12%-20% of the project population, with perhaps 20%-40% of those buying toilets classified as poor households. These figures are better than average, but suggest a relatively low impact on sanitation coverage amongst the bottom quintile. Which is unsurprising given the cost of the sanitation products – the toilets presented ranged from USD 60 to USD 200, with the USD 100 toilet the most favoured. The WSP team suggested that a USD 100 toilet is affordable by the poor when paid by instalments using credit, but even USD 10 per month is a significant cash requirement to someone living on less than USD 1 per day? Interestingly, some of the Indian participants questioned whether it was really possible to build a toilet for only USD 100 (because the BPL incentive provided in India is currently Rs 12,000, or around USD 180, and many states still question whether this is enough to build an adequate toilet). The WSP team noted that it had taken a year or two of research and development to drive the costs down to this level. One interesting learning from this session: some convergence was noted, with the DFID-supported WASH payment by results program (implemented by the SAWRP consortium: including Plan International, WaterAid, WSUP and Unilever in Bangladesh, with payments made for WASH results such as the population using an improved sanitation facility) benefitting from the sanitation marketing work – WSP entrepreneurs were selling toilets to households in SAWRP communities; toilet subsidies, including toilet vouchers provided by DPHE, were being used to buy toilets from iDE entrepreneurs, all of which was felt to ensure better quality and higher value for money (than if the toilets had been supplied by projects or contractors). WaterAid has identified messages to counter these taboos in its campaign, which emphasizes that talking about periods means the chance of a better future. The campaign has now been adopted by the state government of Madhya Pradesh, and is now reaching 220,000 girls and women every week through its use in nurseries (anganwadis) and schools throughout the state. Water for People has developed an e-catalogue for toilets – a software application (in both Android and Flash versions) which allows the user to design and visualise a toilet, then provides the details of the materials required (which can be printed out and taken to suppliers or masons for purchase of the desired materials). The e-catalogue was impressive: an attractive design with clever graphics and a user-friendly interface. It was well appreciated by the sanitation professionals in the room, but the question remains whether it will reach its intended audience? In my experience, the lovely informed choice materials developed by previous programs all around the world are rarely found to reach their intended users – flip books and posters languish in the offices of local officials and trained stakeholders, and are rarely seen by prospective purchasers. WSP designed electronic tools to help local entrepreneurs price and promote toilets in Indonesia (in its 2007-2010 Total Sanitation and Sanitation Marketing program), but most local producers preferred their own slightly tatty photocopied pieces of paper showing prices and options! There is a major challenge to ensure that these well thought out and well designed tools are actually used – all too often the most appreciative audience is sanitation professionals like ourselves, who never use them as intended! We need more explicit metrics to measure the use and effectiveness of these materials – currently not enough effort is made to assess whether these tools and materials achieve their objective (to make sanitation promotion, purchase and use easier and more effective), and the next time around we all make the same mistakes again. UNICEF and WHO ran a session on the Sustainable Development Goals (SDGs). The session made clear that the SDGs, which require that sanitation services are “safely managed”, have much higher requirements than the MDGs, which will have the effect of pushing back progress assessments considerably – that is, countries that do well by MDG measures, may not do well under the SDGs. Interestingly, Bruce Gordon (head of WASH at WHO) was able to present an example for water supply improvement but not for sanitation improvement – noting that 663 million people drank unimproved water according to the recent MDG progress reports, but that 1.8 billion drink unsafe water according to the new SDG indicators (although it was not clear how this figure was calculated, as I assume that comprehensive water quality data is not yet available for all countries). He suggested that the situation will be similar in the sanitation sector, but it was telling that the WHO – one of the co-hosts of the JMP – presented water supply figures at the regional sanitation conference … who says that sanitation is catching up water supply on the development agenda! The WHO presentation suggested that the sanitation indicator (population using safely managed sanitation services) will now incorporate the hygiene indicator (population with a hand washing facility with soap and water at home) in a combined indicator: population using a basic sanitation facility with a hand washing facility with soap and water. This appears to be a departure from previous proposals, in which indicator 6.2.1 measured use of safely managed sanitation services, and indicator 6.2.2 measured presence of a hand washing facility with soap and water. It’s hard to assess the impact of this change – it means that hygiene will not have its own indicator, and risks being seen as a sub-activity of sanitation improvement. Given the very different skills and capacity required for hygiene promotion, this change may undermine the development of adequate hygiene promotion services. Hand washing is also linked to water supply access, which means it is often affected by different factors to those that influence sanitation improvement. I suspect that the combined indicator was an attempt to strengthen the integration of water supply, sanitation and hygiene? However, it could have a contrary effect: hygiene promotion is currently not very effective in generating hygiene behaviour change (best practice interventions such as the SuperAMMA program in India achieve 25% response rates), which means that “safe” sanitation coverage – as measured by this combined indicator – could drop dramatically if handwashing promotion remains at this low level of effectiveness. So perhaps the combined indicator will force sanitation and hygiene specialists to work harder on effective hygiene behaviour change – or will it encourage the construction of temporary hand washing stations for survey purposes, as is often found when ODF verifications require hand washing facilities at toilets? Another comment is that hygiene progress is only measured by the presence of a hand washing facility with soap and water. It had been hoped that other important aspects of hygiene behaviour, such as domestic water quality management, and safe infant and child excreta disposal, might have been included in the SDG framework? The finance session presented theoretical assessments of the total finance required to reach the SDGs (much higher requirements). But these assessments did not recognise real-life inefficiencies, assuming perfect effectiveness in the use of the investments. In my experience, finance ministries and governments often reject calls for higher sanitation finance because of the lack of evidence that the money will be used effectively – previous sanitation investments have rarely proved effective (despite the theoretical finance calculations that show high returns on sanitation investment) precisely because of these “inefficiencies” (which include inefficient and ineffective implementation, corruption, sustainability losses etc). Therefore, it seems imperative that greater efforts are made to identify and analyse these bottlenecks and inefficiencies, and strive for more efficient and cost-effective programs, which in turn are more likely to produce evidence of benefits and convince decision-makers to increase budgets to the levels required. She suggested that efforts to promote sanitation and hygiene behaviour change should recognise these three principles, and make more efforts to surprise people; to focus on the desirable and attractive aspects of the changes; and to situate these changes in the real world, demonstrating that they are normal, acceptable and desirable behaviours. She also noted that the media has an important role in all this, through in framing and disseminating the messages to large audiences. The SAWRP consortium led by Plan International shared their experiences of the first 18 months of the DFID WASH Payment by Results program. I attended on behalf of IDS, but also because – full disclosure – I am the Lead Verifier (part of the ePact consortium team that provides DFID with verification and evaluation services on this program) for the SNV contract, thus have also worked on this program (albeit on the other side of the fence) for the last 18 months. Marc Faux gave an interesting presentation from the perspective of the Plan management team. He noted that the SAWRP consortium had not been well prepared for the program, thus that a number of unexpected costs had arisen: the financial risk management was important, with Plan recruiting a team of specialist financial advisers to hedge against the potential financial risks; the monitoring and evaluation (M&E) requirements were far higher than in conventional programs, which resulted in a much larger and more effective M&E team; and the management costs were much higher than normal, as the program deadlines were tight and non-negotiable (if evidence of results is not provided by the target date, then no payment is made), which required much closer and more regular management than normal. Marc also noted that stronger quality assurance (QA) and results monitoring systems were required because the evidence submitted to support results is verified in detail by a dedicated (and independent) team. One of the major drawbacks was the volume of paperwork required. Marc quipped that Payment by Paperwork might be a more relevant name for the approach, as some of the results required that thousands of pages of records were scanned and shared with the verification team. In general, the verification process was seen as an expensive and challenging process – a necessary evil, with few long-term benefits. Plan noted some staff losses, due to the high pressure and stress of the program; and significant partnership challenges caused by the slightly different understandings of the program at the outset, and the need for the central management team to oversee all of the activities in detail. But Marc also noted that the program provided great flexibility: the partners were free to innovate with their implementation approaches, and encouraged to find the most cost-effective solutions in each context. Stronger and more regular measurement of the results has greatly improved understanding of program effectiveness, with the improved M&E system seen as one of the largest benefits coming out of the program. Overall, Plan UK suggested that the advantages of the PBR approach outweigh the disadvantages, and that they would do it again! The other partners on the stage were less certain: the Plan Bangladesh program manager noted significant concerns around sustainability risks over the next two years – Bangladesh has had major floods every 10 years or so, and is due another large flood in the near future. If a large flood occurs in the next two years, it could dramatically alter the sustainability results and the payments received by SAWRP. The background paper to the conference noted that Bangladesh hoped to become ODF in the near future. Current sanitation coverage was reported at close to 100%, with only 1%-2% of the population practising open defecation. I haven’t worked on sanitation in Bangladesh for several years, but most of the people with recent experience (who I asked about the prospects of an ODF Bangladesh) suggested that the reality was quite different. Most of the country has been declared ODF at one point or another, but this does not mean that everyone is still using their toilets, that the toilets are hygienic, or that there is not some open defecation (even in households where some members use a toilet). All of which suggests that we need to hold ourselves to higher standards. ODF is a great first step towards improved sanitation and hygiene, but we know all too well that it is hard to sustain, and that ODF declaration and verification often masks a myriad of intra- and inter-household issues. Let us hope that the SDG framework, with its focus on safely managed sanitation and hygiene services, will be the next step on the road towards truly sustainable and equitable improved sanitation and hygiene outcomes … and that Bangladesh remains a pioneer blazing the trail towards these higher level achievements! Andy Robinson is an independent WASH Consultant. What India can learn from Bangladesh to end open defecation? Thanks for the lovely update. There is a recent article on a news portal Your Story regarding the same conference. You can also read this interesting blog on SACOSAN and open defecation. 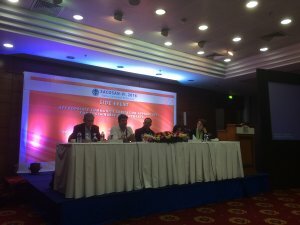 Dhaka, Bangladesh, 11 January 2016: ‘Beyond Just Toilets – Fast tracking an Open Defecation Free South Asia’ the International Conclave held at Pan Pacific Sonargaon, Dhaka, Bangladesh planted the seed of a dream of an Open Defecation Free (ODF) South Asia. The initiative of chasing the dream of ODF South Asia region was endorsed by more than 100 participants of the global conclave, that included policy and decision makers, practitioners, program managers from at least 30 different organizations across five South Asian countries of India, Bangladesh, Afghanistan, Nepal and Sri Lanka.